The final round was upon us and it was all to fish for. The 2 leaders Dale Sheppard and Andy Baily both had 7 section wins each and both needed one today with the other slipping up to secure the title. I was currently in 5th and really needed a section win to guarantee I finished in the money. 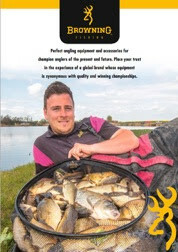 A good draw and doing things right were massively important to give me the best chance of this happening, as the quality of anglers fishing in this league is unreal. It's like the who's who of fishing, and a single slip up could see you finish last in section. The match today was to be spread over 2 lakes, Bonsai and Strip. This would give us a fair amount of room wherever we drew. I pulled out peg 41 on Bonsai and to be honest I was not disappointed at all, as this area of the lake has been quite consistent for producing fish all winter. This peg has plenty to offer as it has an island situated directly in front of the peg at around 17 - 18 meters distance. There is a small overhanging tree on the island, which has branches going into the water. The tree is within pole reach as it hangs well off the island. 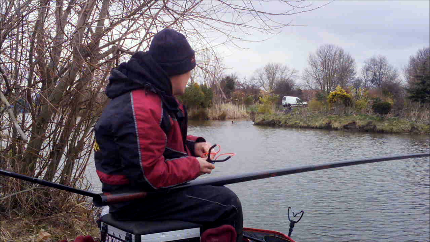 The peg also offers each end of the island and a good amount of open water especially to my left hand side. My plan was to target 2 lines on the pole in line with each end of the island and later in the session a line directly in front of me close to the tree. But on plumbing up the full swim I bumped into a couple of fish well left of my planned target area. I immediately changed my mind and decided to target this area as one of my lines. (This could be something to note that If you do find an area where you bump into fish when plumbing up, don't ignore it, especially when the weather is cold, as there could be a decent sized shoal just sat in that area waiting to be caught!). I also plumbed up a short line, which I planned to target towards the end of the match. For targeting the island I set up 2 bomb rods, one with a bomb and the other with a scoop feeder as well as a single waggler rod; this gives me plenty of options. Float - Drennan Crystal insert, loaded pellet waggler. Shotting - 2 x no 4 locking shot. I tried to keep this fairly simple so that it limited my options. This would force me go more positive with the baits on my tray. For the pole lines I planned to fish 6 mm hard pellet on the hook and feed 4 mm fishery feed pellets via kinder pot and catapult. On the bomb and waggler line I planned to feed and fish 6 mm fishery feed pellets, but on hook on the bomb I planned to alternate this with corn. For the scoop feeder I had some dampened fishery micros for feed and for the hook I opted for 6 mm hard pellet. I started the session by feeding the 2 pole lines with around a dozen 4 mm pellets on each via kinder pot. I decided not to start on the pole though, as I like to give the fish a little bit of time to settle over the feed. I opted to start on the bomb to the left hand side of the island. On the hook I started with corn as this is quite a visual bait and can sometimes trigger a quick response. Unfortunately I never got the quick response I was looking for and it was a good 10 minutes before my first bite. The result was a decent F1. I decided I needed to make something happen, so once the fish was in the net I would change and give the left hand pole line a try. I shipped out to 14.5 meters and lowered the rig in slowly, tapping a few pellets in over the top. A minute or two later I was in and this fish was much bigger. After a decent fight a Carp of around 7 lb was safely landed. The next half an hour produced another smaller Carp and a couple of decent F1s before bites ground to a halt. I then switched to the right hand side line, which I had been loose feeding with 4 mm pellets via catapult. This produced a few smaller F1s really quickly. In a bid not to let the bites dry up, I decided to start switching regularly between the two lines with an aim of taking just one or two fish of each. I maintained feeding the left hand line via kinder pot and the right hand line via catapult which seemed to work really well. On the odd occasion I had a try with the bomb or waggler but they never produced hardly any bites. I did managed to pick 2 quick fish up on the scoop feeder but this ended up being a flash in the pan, as it never produced another bite! As the last hour and a half approached I was really struggling for bites so I started loose feeding pellets close to the overhanging tree and on the short line at a top 2 plus 2 distance. This did me the world of good as I started catching really well. The remainder of the match was spent switching between these 2 lines. 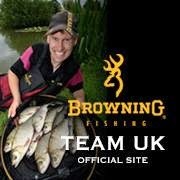 As the scales arrived I estimated I had around 50 plus pound and I was really pleased when I weighed in 59 lb dead. This gave me second in section; It was a nervous wait as the results were worked out and I was delighted to hold on to 5th place, which was the last place in the money - Congratulations go to Dale Sheppard who won the winter league overall.